Meant for the frequent flyer both in and out of the Georgian Bay area, this program provides a number of excellent features. Aside from the cost savings, an annual ground briefing and check ride will ensure not only that your recurrency requirements are met, but also that your skill level is maintained and improved. Should you require work in a particular exercise, your instructor will diagnose the need, recommend specific training and practice, and conduct the required re-training. A members area with online booking, study guides, flight planning material, weather information, and more. 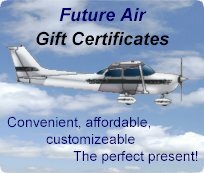 Future Air's VIP Membership program costs only $35.00 per month and is billed monthly on your credit card. So, if you fly just one hour per month and use an instructor twice a year, your annual savings will be $451.00. And if you are a student flying once a week, using an instructor twice per month, your savings will be $859.00 - the more you fly, the greater your savings.